If you are already a customer or you follow our news, you know that over the past few years we have been taking the use of our tools very seriously, allowing you to better collaborate with your teams. Now, you have the possibility of giving access to your account or sub-accounts to other employees. Now, you can go even further in the management of access sharing by selecting advanced restrictions. Improve exchanges between your teams by giving specific roles to your employees. You can also set who has the right to block sections, manage your gallery or edit your e-mail templates. In your account, head to My Account > Account Sharing. Here, you can invite new users and set which pages and which of your account features you would like to give them access to. Let’s take a specific example: you want to invite your designer to create templates on your account, but you don’t want to let her send an email, because you would like to validate each of her creations before they are used. Simply select the role “Designer” when you invite her to your account. She can access all the templates but can only save them in ‘Draft’ status. She will also be able to block the formatting of some sections to prevent other employees from modifying them. If you don’t want to choose one of the predefined roles – Accountant, Developer, Marketer or Designer – you can choose the “Customized” option and individually select the pages or features to which you would like your colleague to have access. You now know all you need to ensure that your team members only manage actions they are responsible for, according to the roles you yourself will have set. This feature is available only for Premium subscriptions starting with Cristal. The number of people to which advanced restrictions can be applied is limited based on subscription type. When you edit a template, you can now choose to block one or several of its sections to prevent one of your employees from editing or deleting them. That way, you can better protect the design of your emails and make work easier for your teams. As for your employees, they can focus on tasks that are assigned to them. Users for whom you have not assigned modification rights for the locked sections will be limited when editing a template. If you have completely locked the section, no access will be allowed (as shown in the image below). If you have blocked editing for formatting only, they can update content without having any impact on design. You can now edit your email without needing to publish it. Why is this useful? You can modify your template without worrying about affecting a template which is already in use. While waiting for a template to be validated, you can simply save it as a draft. Saving a template in draft mode also lets you authorize members of your team to work on it without necessarily granting the right to publish, leaving you as the designated person in charge of publishing the final version. That way, your marketing templates in draft status won’t be visible in your gallery when you create a new campaign. Additionally, changes made to an automated template won’t be applied to a workflow once it has been published. Lastly, the final ID of a transactional template will not be provided unless you have published it, thus preventing you from affecting an email in production. You can head right over to your account to implement advanced restrictions and make collaboration easier between your teams. Facilitated Collaboration And Advanced E-mail Template Management, New At Mailjet! Ho, ho, ho… No, it’s not Christmas yet, but it’s easy to see why you might think so at Mailjet! Have you been very nice this year? Probably, because today we have six gifts for you that you can unwrap under the tree (the tree being your Mailjet account – play along ;)). We are proud to announce the arrival of a bunch of improvements and new features. In a few minutes, you will learn about everything you can now benefit from as soon as you next log in. In order to prevent the back and forth in the steps leading to template publication, we have implemented features to let you take on the role of each of your team’s members. Set which employees can edit a template’s sections to protect the content or your design. Improve collaboration between your teams using advanced settings to define who has the right to block sections, manage your gallery or edit your templates. This feature is only available for Premium plans, on Crystal and above. To prevent errors and make it easier to fix them, here are two new features that will put your mind at ease. Select the template of your choice and see up to five previous versions published, allowing you to go back to a previous version at any moment. Save changes to your templates without needing to publish them by using Draft mode. That way, you can work on your Marketing, Automated or Transactional email templates without affecting those already in production. Additionally, you can allow some members of your team to continue working on drafts without granting them the right to publish. In your gallery, you now have access to a search field that lets you find templates or template categories by simply typing the name, the desired language or the label of your choosing. We also added a new scrolling menu to let you organize your templates the way you like. You can now sort them in alphabetical order, or by last modified or creation date. You can now add labels to your templates to easily find them in your gallery using their color or apply a filter to group them together easily when you are searching for them in the search field. So, isn’t it time to go make a hot chocolate, set your computer on your lap(yes, using it as a heating pad is a well-known trick) and unwrap all your gifts? Stay tuned – in the next few days, we will present these new features in greater detail so that you can get the most out of them. While you wait, tell us what you think of your gifts on Twitter and who knows, maybe some new gifts will land under the tree before Christmas ;). With our editor, Passport, we have made it much easier for marketers to create responsive emails and work with developers. Now, in just a few clicks, anyone (yes, anyone) can create an attractive and modern email template. We thought it was about time we looked after developers too, even though we hadn’t completely forgotten about them. We know our markup language MJML has been a great help and email developers all around the world have already fallen in love with it. ? With our WYSIWYG email editor, it was already possible to preview your email in HTML or MJML format. Now, we have some good news that will simplify your user experience as a developer even further (the fifth point should knock your socks off!). Previously, when editing HTML emails, your editor was divided into two equal parts with your code on one side, and the preview of your email on the other. To see a bigger version of either one of them, you had to close the other one. Now, to simplify your editing, you can size your windows as you like (taking up up to 70% of your screen), without having to close one. Our previous email editor allowed you to generate a plain text version. Now you can also edit it. Little reminder: What’s the point? ● The plain text version is useful as it is easily scanned by anti-spam filters. Put all the odds in your favour; your deliverability is at stake! ● Although rare, there are some email clients that do not use HTML. The plain text version is a way to guarantee your recipients will be able to read your message. ● Some people choose to activate the ‘plain text only’ option in their inboxes so as to avoid receiving marketing emails. Creating a plain text version guarantees that everyone will receive your messages. Simply click ‘plain text version’ in your editor. We advise you to reduce the number of links in this version to make reading easier. Whether you want to personalize your emails with stored contact properties or simply add links so your recipients can share your email on social media, all you have to do is click on “variable” in your editor. Find all your useful links by selecting the “Predefined Tag” option, and easily insert your links for social media sharing, the sender’s email, a permalink or even an unsubscribe link into your email. Previously, to insert HTML-coded images into your email you had to import them beforehand. From now on, you can do it from Passport by simply clicking on the “Image” button in the top left of the screen. This function will please those who like to modify their code several times before they are completely satisfied. When navigating your code, modified sections are highlighted in the preview area of your email. As such, before making modifications, you can easily see which part of the code you’re working with. Great, isn’t it? We told you it would knock your socks off… We hope they weren’t your favourite pair. Still reading this article? All these new features are already available in Passport! So go on, go try them out in your account and tell us what you think on Twitter. ? Since we launched Passport in June 2015, our email editor has gone through many changes (*sniff* they grow up so fast). By combining our ideas with your feedback (that’s right, we’re listening), we hope to make email creation as simple and fast as possible. Today, we hope you’ll be delighted to learn about some new improvements and features we’ve implemented. We think you’ll like them so much that you’ll wonder how you ever survived without them. Go ahead and block off your calendar, so you can read what’s to come. We’re all but certain you’ll rush to test out the new features. To make editing emails easier, you can now define styles which will apply to paragraphs, titles, links or all elements. Once you’ve defined these in the left-hand menu, styles will be applied to all the elements already added to your emails and will continue to apply for future emails. Moving forward, if you’d like to change just one element in your email, doing so won’t have an effect on overall styles you’ve created. To try out this new tool, simply head over to the “formatting” section of Passport. To increase traffic to your social networking pages and let readers share your newsletters, we’ve improved the features letting you insert social network icons. From the menu, simply drag and drop the “Social Networks” icon, then click the section and the bolt icon. A “Configuration of social networks” icon will appear. Pro tip: at the top of your email, insert icons for the social networks you are most active on to encourage readers to follow you. At the bottom of your email, offer a share option, and don’t forget to include every social network. Emphasize the share links using a call to action, such as: “Did you enjoy our newsletter? Spread the word”. Whether you’re editing marketing, transactional or automated emails in Passport, it’s possible to insert variables directly in your content to customize your emails. To make this customization even easier, a pop-up now shows up when you wish to insert variables. It allows you to visualize properties you’ve associated with your contacts. Select the variable that interests you and fill in a default value. When you’re ready to send your emails, this variable will be automatically replaced by the corresponding contact’s value. Templating languages are perfect for making user experience even more relevant. Using just one dynamic template, you can create an email that adapts to each transaction and each recipient. To make things easier, we just added a template to the transactional email gallery that lets you do this. You can use it to find inspiration for future emails. 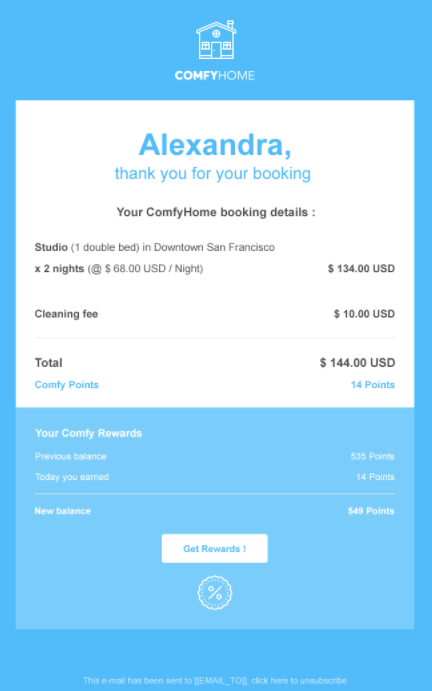 To let you see all the options available to you, let’s take the example of an apartment rental company that offers its most faithful clients loyalty points every time they make a reservation. 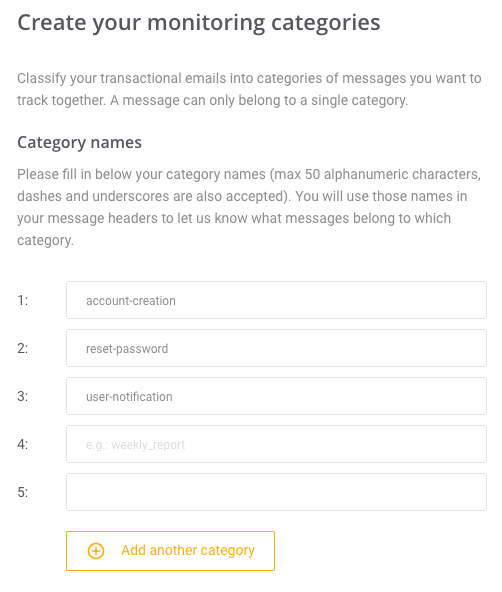 With this template, the templating language allows both subscribers and those not yet subscribed to receive bespoke messages, all from just one e-mail. The message is tailored according to their profile and clients are encouraged to reserve again without any alteration to their user experience. Neat, huh? We are positive this example will awaken a sudden urge to make some changes to your marketing strategy so that it includes templating language. Head over to your account to test out this template and let your imagination run wild as you modify it to suit your needs. We promised you’d be thrilled! Now go try out these new features on Passport. There are so many … Where to start? What other features are you hoping to see implemented soon? Tell us on Twitter. Mailjet loves to make life easier for users. In fact, last year, Mailjet integrated MJML in Passport to make collaboration between marketers and developers a smoother process. Mailjet also made it easier to create emails with a new image editor. So the time has come to focus on email editors. Now they can save the most important campaign sections in a library. The drag-and-drop feature lets them easily use those sections again in future emails. How much time have you wasted redoing your email header and footer? Probably too much. The header and footer usually feature your logo and the most useful links, or those that take users where you want them to go first. Don’t waste any more time creating them for each new newsletter or email campaign—now you can access them right from your editor and add them with a simple drag-and-drop. If making your brand image clear is as important to you as it is to us, there’s a chance you’ve already set up a graphic charter for email design. The latest feature makes the process easier and more efficient. Prepare section templates for each type of content used in your marketing emails and save them in your library. That way, you can just grab what you need for your next newsletter. Using the feature takes less time than the intro of your favourite song on your morning playlist. Just activate the ‘Advanced mode’ at the bottom of the menu on the left-hand side of the Passport email editor. To add it to an email, select it from the library and put it wherever you want via drag-and-drop. Easy, right? We knew you’d be excited! What do you think of this new feature? Which section do you plan to save first? Let us know on Twitter!